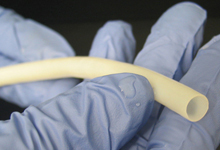 Is tissue engineering poised to transform heart bypass surgery? Tissue engineering is one of the hottest fields in 21st century medicine, and last year I discussed how one leading scientist in this field, Professor Laura Niklason of Yale University, has made important strides in the development of artificial arteries. Now scientists led by Laura Niklason have announced another important milestone in the development of artificial blood vessels; blood vessels that she hopes will be suitible for many patients undergoing operations such as heart bypass surgery for whom no other suitible blood vessels are available for transplant. While most of the reports suggest that clinical trials of these articficial blood vessels will start in the very near future, a report on the NHS website highlights the observation by Laura Niklason and colleagues that the number of animals used in these studies was quite small, and that further animal studies of longer duration will be necessary before clinical trials in humans can begin. Nevertheless this is a significant medical advance, and I hope that the further animal studies, which are probably under way as I write, confirm the excellent results seen in this weeks report and allow clinical trials to commence. Posted on February 4, 2011 April 14, 2014 by EditorPosted in News, Science NewsTagged artery, artificial blood vessel, baboon, coronary artery bypass, David Putman, dog, heart bypass, Humacyte, Laura Niklason, Tissue egineering, Yale University. Previous Previous post: Albert Sabin and the monkeys who gave summer back to the children.